Green Goddess Hard Lemonade - Home. Made. Interest. 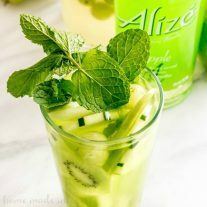 This post was sponsored on behalf of Alizé via One2One Network. All opinions stated are my own. Green Goddess Hard Lemonade is an adult hard lemonade recipe that makes the perfect summer cocktail! Summer is all about sunshine and lemonade…maybe some sweet tea too…but mostly lemonade and I’ve got an awesome hard lemonade recipe for you that is going to add some serious fun to your summer. This Green Goddess Hard Lemonade was inspired by a non-alcoholic lemonade I bought at a block party hosted by my son’s school to celebrate the end of the year. Green Goddess Lemonade is totally different than any lemonade recipe I’ve ever had. It is loaded with green fruits and vegetables. You read right, my Green Goddess Lemonade had spinach in it and I couldn’t believe how good it was. For my own adult version I made Green Goddess Hard Lemonade. 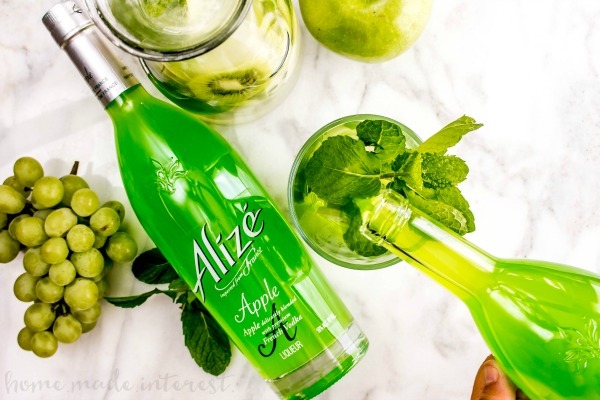 It took inspiration from the lemonade I enjoyed so much and a big, beautiful green bottle of Alizé Apple. 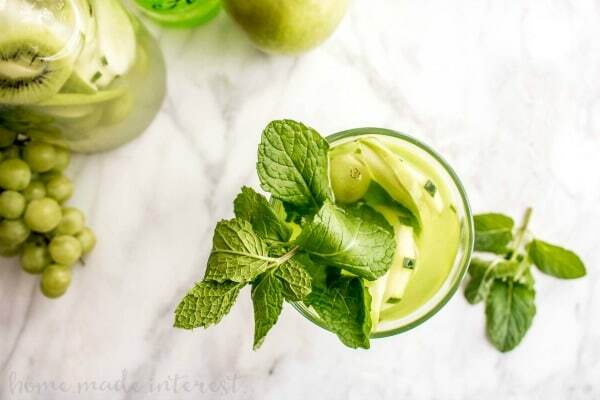 My adult version of this tasty summer drink leaves out the spinach but crams the fresh squeezed lemonade full of green fruits and veggies like grapes, kiwi, cucumbers, and fresh mint. The fruits and veggies are added to a big pitcher of lemonade so they can absorb all of the sweet and tart flavor of homemade lemonade and when it is time to serve up the cocktails each glass gets 3 ounces of Alizé Apple (find it HERE) and 5 ounces of lemonade. If you’ve never had Alizé it is a premium French Vodka blended with different fruits. 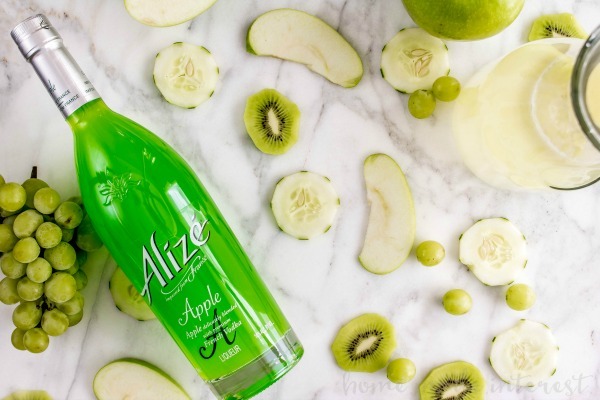 Alizé Apple is a new member to the Alizé family and from the minute you open the bottle and smell that apple scent you’re going to be a fan. 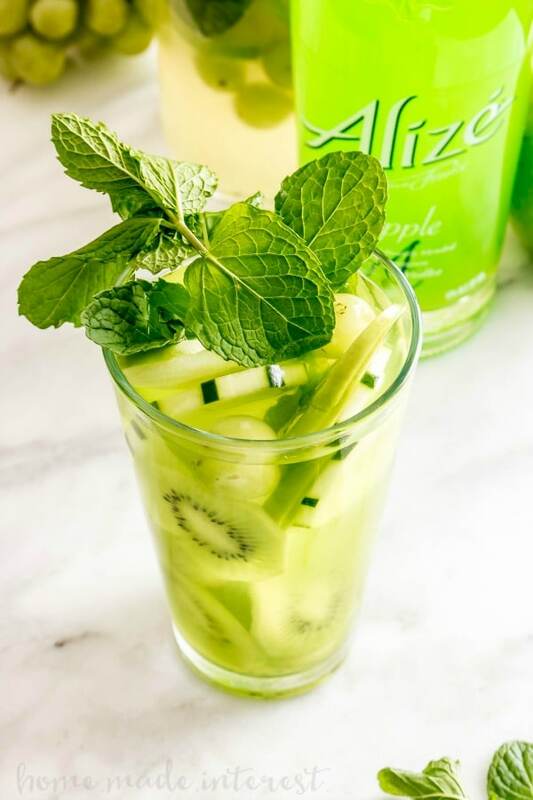 Alizé Apple is a French vodka blended with the delicious taste of green apple.The Alizé Apple cuts through the tartness of the lemonade and they meld together to make one pretty amazing Green Goddess Hard Lemonade! 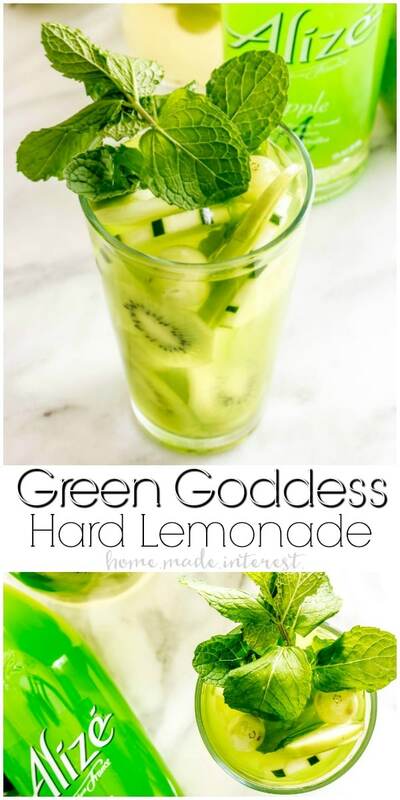 Green Goddess Hard Lemonade is a simple summer cocktail recipe that takes lemonade to a whole new level! Squeeze lemons for fresh lemon juice. Add sugar to the lemon juice and stir until dissolved. Pour sweetened lemon juice into pitcher and add 3 cups of water. Stir well. Add apples, grapes, kiwi, cucumber, and mint leaves to pitcher. Add ice to a glass and pour 2 ounces of Alizé Apple to it. Add 6 ounces of lemonade and stir well.